Wow, Jan 23 was my last post? Sorry about that. working from home. This is really nice, as it saves me about 60 minutes and 60 miles of travel each day (and with gas over $3/gallon, that really adds up: even in my BMW, which averages about 26 mpg, that's about 2.3 gallons per day, or roughly 11.5 gallons a week - that is, about $35/week or about $140/month saved by not travelling to/from the office across the bay). 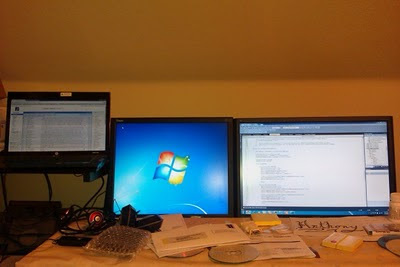 Yeah, that's right: I have three displays. (OK, Mr. Tech Nerd with a whole wall of displays, you have me beat, but hey, I've been living with just the laptop and one display - both at home and at the office - for, well, since I started working here.) Granted, the laptop is sitting a little higher than the other two displays, and it's still a pretty small resolution (and far, far away), but that's OK; I can just put my e-mail over there and keep it up and visible but out of the way of my main working space, and now I can lay out my code and form designers side-by-side, or various other things, which should make me twice as productive (so it's a win for the company, too! ).